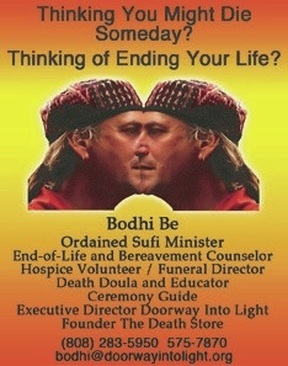 providing conscious and compassionate responses to dying and death since 2006.
bodhi earthday-desktop.m4v from samsmall on Vimeo. TO EMPOWER AND SUPPORT families and communities with holistic, sustainable and family-based tools, skills and information in the care of the dying and the dead. TO TRANSFORM our culture by transforming attitudes and relationships with aging, dying and death. TO RECLAIM the care of the dying and the dead as ‘village building’ work and sacred service. Reclaiming what we've given away to businesses and institutions. Read more about our vision. ​to those in need and to insure that no one need die alone.